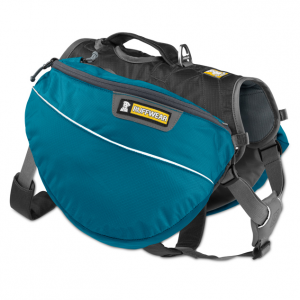 A dog pack that's ideal for day hikes and overnight adventures, the Ruffwear Approach dog pack lets your 4-legged friend help out with the gear load. Keep Fido fueled and hydrated at home, wherever "home" may be. The Ruffwear Basecamp Bowl makes it easy for him to dig in with a concave shape that allows food and water to collect in the center. The Ruffwear Beacon is a waterproof, rechargeable safety light that helps keep dogs visible in low light or inclement weather. The quick clip attaches easily to apparel, harnesses, collars and gear. A warm, dry dog is a happy dog. This Ruffwear Cloud Chaser jacket lets you stay out longer during inclement weather, protecting your four-legged friend from rain, snow, wind and cold. Crag dogs, powder hounds and mountain mutts will love this comfortable Ruffwear Crag dog collar and all the adventure-filled places it can take them. Protect your car's nice interior with this durable, waterproof and comfortable cover that shields vehicle seats from the remnants of dog adventures. The Ruffwear Flat Out leash is an everyday leash that blends durability, versatility and outdoor aesthetics. 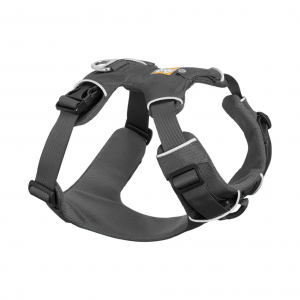 It's adjustable and can be handheld or worn around your waist for a hands-free leash walk. Help your dog stay buoyant on the water next time you take her out for a paddle, swim or surf session with this Ruffwear Float Coat dog PFD. It's designed for dogs of all shapes and sizes. The Ruffwear Front Range dog harness is a comfortable harness that your pup can wear all day, everyday. It's durable and made for fun adventure. Sturdy yet light, the Ruffwear Front Range dog leash keeps you connected to your canine companion wherever your adventures might take the two of you. It may look like a pine cone, but your pup will realize the Ruffwear Gnawt-a-Cone toy is way better. Designed to engage and reward, its bouncy exterior houses an easy-to-clean internal treat chamber. Entertain your furry friend for hours with the Ruffwear Gnawt-a-Rock toy. Its natural latex rubber design dispenses treats, massages gums and bounces irregularly for interactive play. Inspired by Oregon driftwood and crafted from gum-massaging rubber that bounces in an engaging and erratic pattern, the Ruffwear Gnawt-a-Stick toy makes fetch work anywhere. Ruffwear Grip Trex dog boots set the standard in paw wear for 4-legged friends who hike, bike, run and explore the great outdoors with their humans.